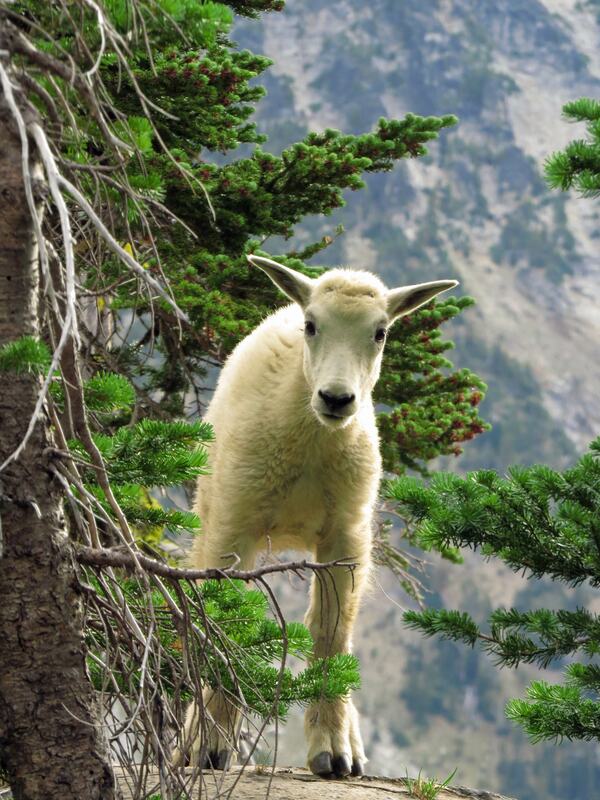 Remember, fellow hikers~ a fed goat is a dead goat. While these mountain goats and their eight compadres were highly entertaining, they had clearly been fed or allowed to lick people for the salt in sweat. Ignore them as they patrol for your lunch and let them avoid getting in trouble that will inevitably get them “removed” by the services. So would the Forest Service be mad if I posted a giant sign at the trailhead saying, “A FED GOAT IS A DEAD GOAT”? There is a sign at the trailhead warning people about dangerous goats with their lethal pointy horns, but no sign posted saying why the goats have gotten so aggressive. That would be us, my friends. More on goats later. 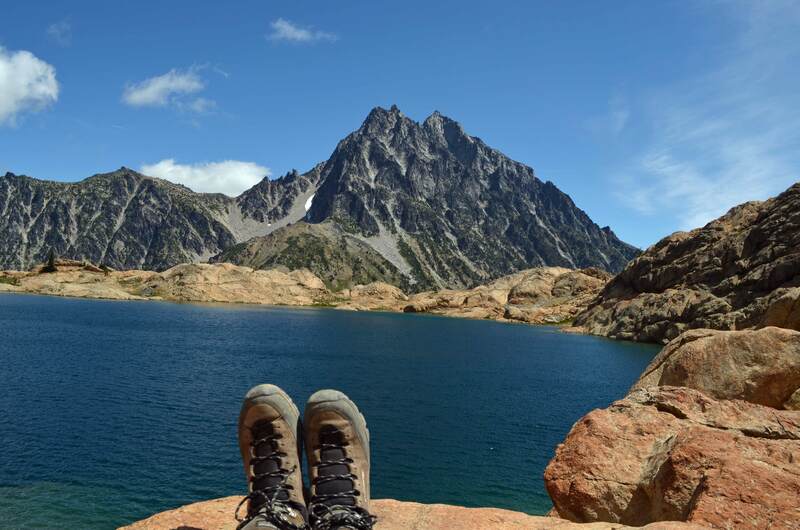 We decided to try Lake Ingalls on a day with promise of views of Mt. Stuart. In all the time I’ve been here, I’ve seen Stuart, and been up it on a clear day, but every time I’ve brought someone else, it’s been cloudy at the top. Not so today. The parking lot was very full, but surprisingly, there were few people on the Lake Ingalls trail. Perhaps most were headed for Esmeralda Basin. The hike up was easy most of the way, crossing softening avalanche fans a couple miles up. There is a profusion of spring beauty flowers and some glacier lilies, meaning the real flower show is yet to come. It was a perfect day temperature wise, with a light wind to keep us cool. Past the intersection with Longs Pass, the trail cuts into a basin that was snow covered for the most part. We picked our way up and stopped for views, only to have a goat leap past us and then circle around to a rocky outcrop. Two guys had just come down over the rocks, and three folks were on their way up, so we figured they had spooked the goat. Then we got up to the camp area below the pass and there was an adolescent goat checking out four unoccupied tents. Another adult was wandering the snowfields. We proceeded up to the pass on snow to the area where people like to picnic and decided to stop and enjoy the highly unusual solitude and lovely views of Mt. Stuart and the basin. Suddenly, we saw a herd of 10 goats start up from Headlight Basin toward our locale. 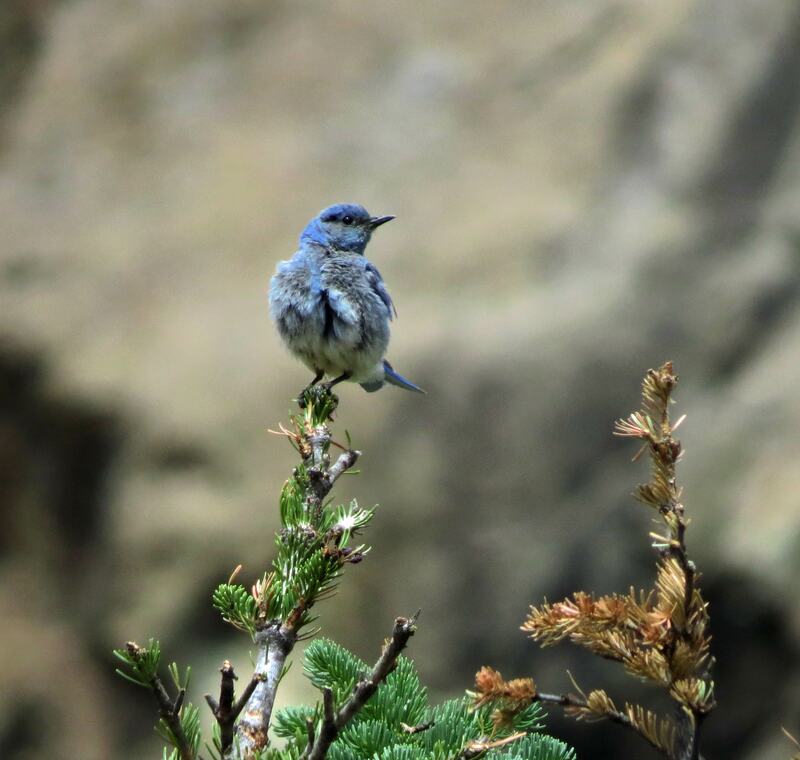 We were thrilled as they formed a line and ascended the slopes – and surprised as they came over the rocks toward us- and then we were scrambling to pick up our lunch as they streamed over the ridge right past us, pinning us to the edge. Two woolly babies bleated in protest throughout the promenade past us, but their mothers looked pretty determined to make us drop our granola bars. Yes, they’re cute, but their mamas have giant horns. 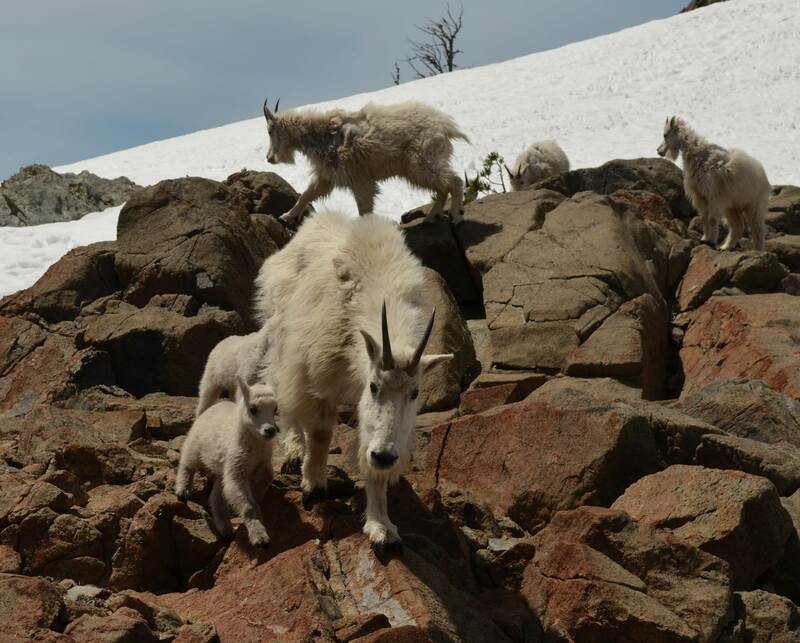 The goats made patrols and passes for over an hour, sometimes hovering on the rocks above. Clearly, they associate people with food. 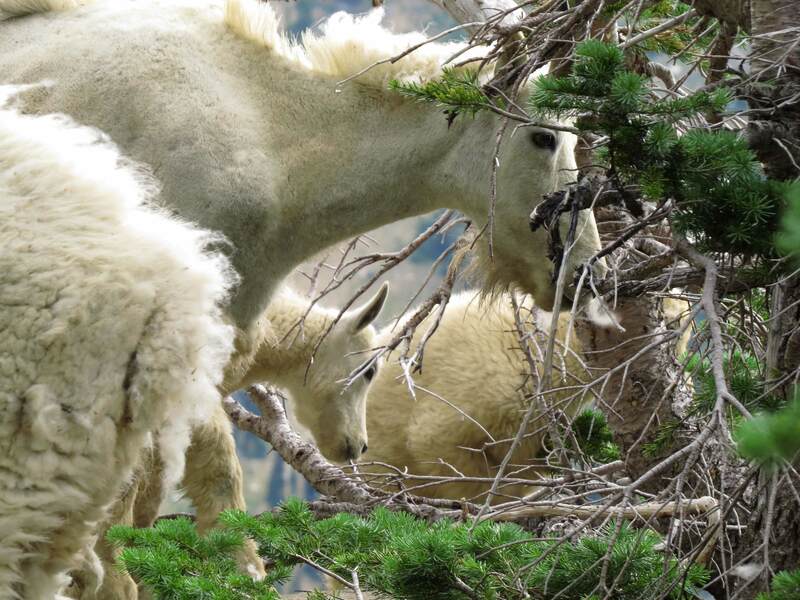 I have never seen this behavior, but after reading the warning from the Park Service about NOT LETTING THE GOATS LICK PEOPLE’S HANDS AND ARMS at Mt. Ellinor, I figured these goats had been corrupted like the red foxes at Mt. Rainier that get too many balogna sandwiches and then get smashed on the road hanging out for more handouts. We ignored the goats and they eventually dispersed, leaving us to rest in the sun and enjoy a light nap until- BAAA! There was a goat baby and mom right above us. Yikes. We watched some scramblers coming down the gully between South and North Ingalls peaks and finally shook ourselves out of our pleasant little spot, which not another person had visited in over two hours. 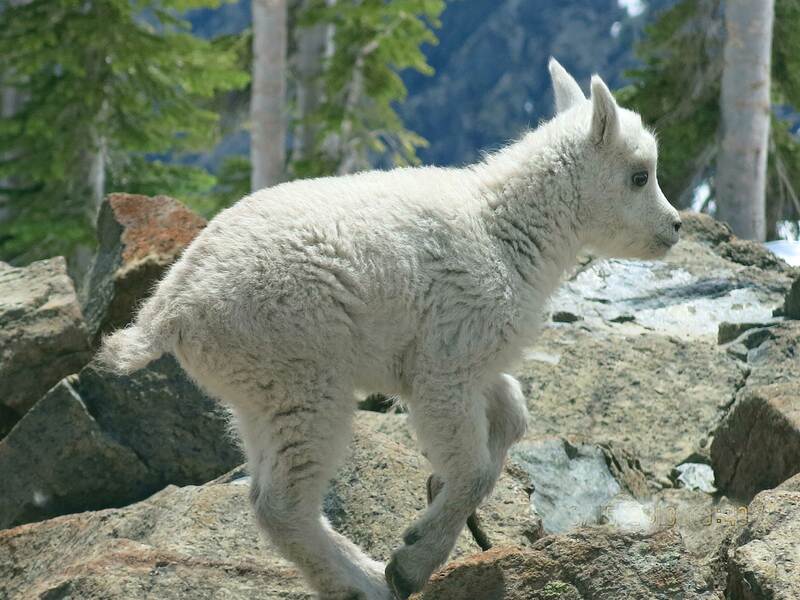 So Ingalls Pass is an excellent place to see mountains and mountain goats, but please please please don’t feed them or let them lick your arms. Wildlife always pays the price for human indulgence in the end. Drop the granola bar, now!